​You may already know that secondhand smoke is dangerous for anyone, especially children, but did you know that smoke can stay in a room for a long time after someone smokes there? After smoke has been in the air, it settles on surfaces in rooms throughout the building. This smoke can be ingested by children, making them sick with ear infections, bronchitis, pneumonia, or Sudden Infant Death Syndrome (SIDS). The smoke can be inhaled by children, or ingested through putting items in their mouths. It is important to understand that opening a window, sitting in a separate area, or using ventilation, air conditioning, or a fan cannot eliminate secondhand smoke exposure. 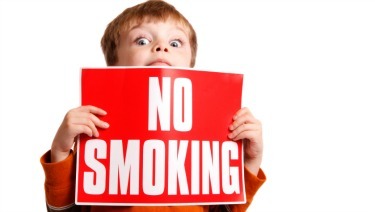 If you cannot quit smoking, it is important to maintain a smoke-free environment in areas where children live or play. Never smoke inside your home, even when it's cold outside. Smoking indoors one time is enough to contaminate the rest of the house, even if you're in a room with the doors closed. Create a comfortable place to smoke outdoors for both yourself and any visitors who smoke. Keeping an umbrella near the door will help encourage you to go outside to smoke even when the weather is bad. Let guests know that your house is smoke free and show them to a child-free area where they can smoke if they need to do so. Consider posting a sign to remind visitors that there is no smoking in your house. Do not smoke, ever, in a car that transports children. Smoking in your car even once can fill the seats and other materials with toxins, even if the windows are open. Remind passengers not to smoke in your car. Try to time your smoking to coincide with times when you know you will be without children at another location- Headed to work, where there is a designated smoking area? Try to hold off on smoking until you get there. You will keep your child healthier, as well as your car! Fill your car's ashtray with spare change so you aren't tempted to fill it with ash. Leave a cell phone charger or other device plugged into the car's adapter outlet so you are not tempted to use it as a lighter. Store your cigarettes in the trunk or in another out-of-reach area while you drive. Consider putting up a sticker or decal on your car that reminds passengers that it is a no smoking vehicle. Remember that the only way to completely protect your family from the toxic chemicals in secondhand smoke is to quit smoking.